You’ve probably heard of farm-to-table, meaning that the ingredients have come directly from the farmer to the restaurant or are being sold to you by the farmer himself. Now there’s a new one those in the agriculture world should learn: farm-to-lightbulb. If you have plenty of farmland and high electricity costs, a solar power system should be on your radar. There are plenty of incentives and rebates to help you as you make the transition to clean, renewable energy. Farmers also interested in generating not only power but revenue through the installation of solar panels on their property may also face some barriers from those who think the energy production will wreck the land. But rest assured, says the Department of Energy (DOE), which has a “Farmer’s guide to going solar” where they answer a number of vital questions for those hoping to combine food and energy production. One of the first things for any farmer to ponder is whether their land will suffer irreparable damage or contamination if they decide to install solar panels. According to the DOE, this is definitely not the case. “Silicon-based PV (photovoltaic) cells are the most widespread solar photovoltaic technology used. Most solar panels have a glass front that protects the PV cell and an aluminum or steel frame. Research shows that ‘leaching of trace metals from modules is unlikely to present a significant risk due to the sealed nature of the installed cells’,” they explain. Another concern for many farmers is whether placing solar panels on their grounds will heat up or dry the soil under or around them. Scientists have proven that the reverse is true. 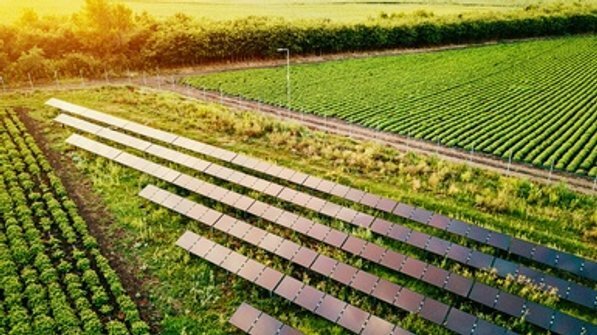 “Solar modules will actually cool crops and vegetation underneath during the day due to shading, and keep them warmer at night…Modules can provide farmers the ability to grow shade-tolerant crops and to diversify crop selection, while also extending growing seasons and reducing water requirements. One study found that shading from solar modules produced lettuce crop weight equal to or greater than lettuce grown in full sun,” the DOE guide explains. In fact, this type of set up has led to the field of agrivoltaic, where solar installations are combined with crops and pasture animals. An example of this are the solar panels in the fields at the University of Massachusetts Crop Research and Education Center. There, the solar panels are mounted seven feet off the ground and are separated by two or three feet, allowing for light to pass through these spaces and reach the crops growing underneath: kale, Brussels sprouts and cilantro. Since the solar array was developed in 2011, agronomy professors have seen encouraging results. Grass cultivation underneath the solar panels have yielded more than 90% as much volume as land that received direct sun. Also, vegetables grown under the panels, including broccoli and peppers can produce 60% of the volume they would under direct sun. Will solar panels hurt the animals? The solar panels at the UMass Center are position high enough that they leave enough room for farmers or cows to pass underneath. Larger animals like antelope or elk can be kept off by a security fence, if there’s any risk they could damage the solar panels. Everyone knows that water and electricity don’t mix. This is true for solar panels as well. To avoid this dangerous mix, the DOE guide recommends raising all electrical equipment at a safe height in flood plains. “Raising equipment could increase the cost of installation and may negatively impact the project economics. Also, the cost of insurance will be higher for PV systems in a flooding area. An area that will not be flooded may be better suited for PV installation,” the DOE explains. The life of solar panels is estimated between 20-25 years, which means you won’t have to worry about this for a while, but land underneath those power modules can be reverted back to agricultural uses after they are removed. “Giving soil rest can also maintain soil quality and contribute to the biodiversity of agricultural land. Planting crops such as legumes underneath the solar installation can increase nutrient levels in the soil,” the DOE guide says. Farmers can find out more about their solar energy choices by signing up here!